Since it’s Friday, how about a little Whaler history lesson? Did you know that Boston Whaler was once owned by Reebok? Yes, that’s right, the same company that builds the shoes. 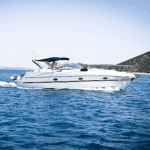 The unsinkable Whaler is currently owned by Brunswick, along with other popular and successful boat brands like Bayliner and Sea Ray. Last time, we talked about Whaler custom and universal center console covers and seat covers. 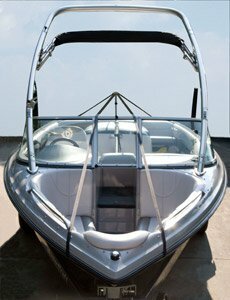 While those are great items to have for quick storage and protection, you’ll be much happier in the long run if you cover your entire boat. Let me tell you a little about what makes Carver’s Boston Whaler boat covers the best choice for fit, longevity, and value. Motor Covers- Attached or Separate? Carver includes a motor cover free of charge with your custom cover purchase. 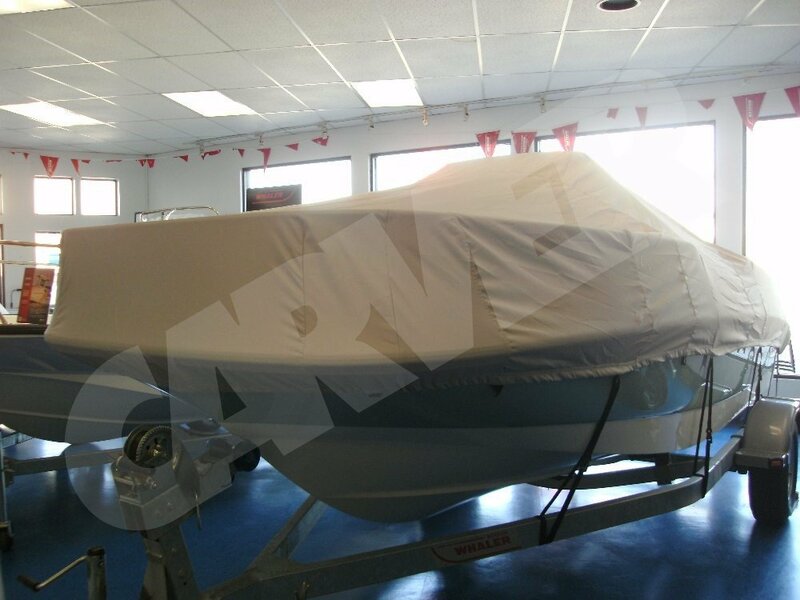 Whether the motor cover is attached or separate depends on the best option for the particular Boston Whaler being covered. I am a big fan of the attached motor pocket. As you can see from some of the photos, our manufacturer, Carver Industries out of Landrum, SC, often attaches the motor pocket directly to the back of the boat cover. One piece of canvas is just much easier to manipulate, in my opinion. However, as with all things in life, it’s never that simple. Carver is dedicated to making the best fitting, best looking custom covers possible. That means, in many cases, putting a separate motor cover on the Whaler. If you want to know whether your motor cover is attached or separate, you can always call us, and we’ll be happy to find out the specifics for you. That way, you’ll know exactly what you’re getting. Carver spares no expense in reinforcing critical wear points on the custom covers that they build. That said, Whaler is such a well-engineered boat that there aren’t a lot of sharp areas. Our materials, including Sun-DURA, Sunbrella or Poly-Guard, are all very strong materials that will last for years to come, even without reinforcement. Each cover purchased will come with a tie down kit. Each tie down kit consists of black polypropylene straps with buckles, kind of like the ones you would see on a life jacket. These tie down straps go through the tie down loop that’s sewn about every three feet around your cover and down around the trailer. After you’ve fit the straps the first time, tying the cover down for storage or trailering in the future is, well, a snap. Each cover comes with a drawstring storage bag. 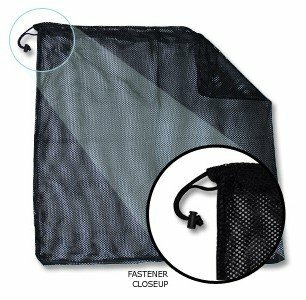 This black mesh bag is large enough to fit the bulkiest of covers, so there’s no problem getting your cover into the bag. The mesh has openings that allow the cover to breathe while it’s in the bag. We figured these are things you really need in order to use your cover, so we included them for you, free of charge. The best way to prolong the life of your Boston Whaler cover is to keep it supported so that water doesn’t collect on it. Many of our customers already have support systems (they last forever, it seems), or they are crafty and design their own systems. If you need support, consider our support systems and support poles, which are excellent and easy ways to keep your cover supported. 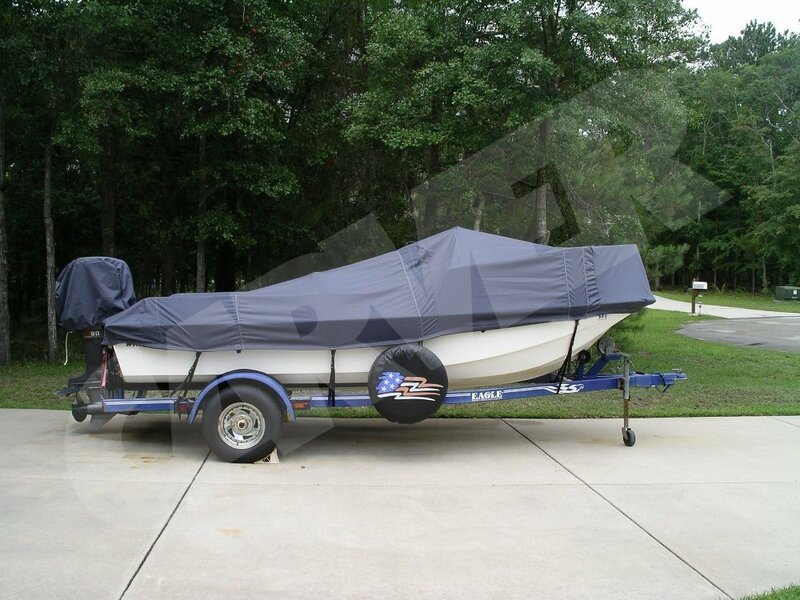 We are proud to sell covers made by Carver Industries for Boston Whaler boats. 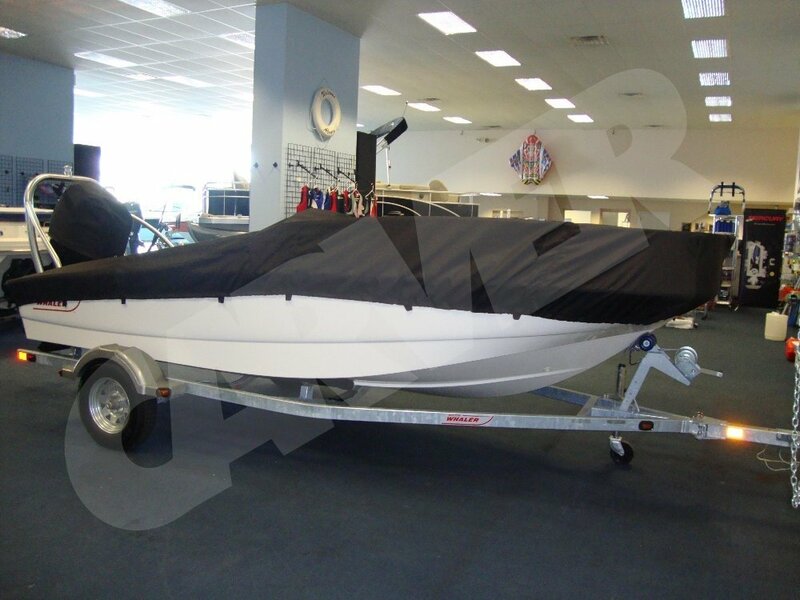 For over 30 years, Carver has been patterning boat covers. These handmade covers are guaranteed to fit and built to last. Each cover is handmade in the factory in Landrum, SC, with a focus on precision and attention to detail. Many of our Boston Whaler customers are engineers, and they know quality when they see it. It’s nice to be able to sell a cover when you’re confident that it will fit and perform exactly as it’s supposed to. From speaking with the pattern maker of these covers, I learned that the position of the bow rails on a Boston Whaler made them a challenge to pattern. Because the rails are a couple of inches off of the gunnel, the boat cover requires more darts to get a proper custom fit at the nose. Carver also makes the Bimini tops that we sell for Boston Whalers. This same pattern maker shared a simple technique for using our Bimini top on the Montauk 17 that should make boating much more enjoyable and easier. Curious? Check out the blog next week for more information. Want to protect your “unsinkable legend” with one of the best covers on the market? Give us a call, and receive a 10% discount for mentioning this blog.